Looking for a treat to serve at your Fourth of July party that is sure to be a big hit? 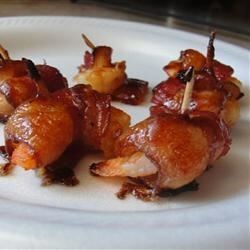 Try this recipe for Bacon Wrapped Barbeque Shrimp! It combines the popular idea of wrapping shrimp in bacon with barbeque seasoning that adds an “Americana” feel. Multiply this recipe based on the size of your gathering and watch them be devoured in minutes. This entry was posted on Friday, July 3rd, 2015 at 1:51 pm	and is filed under easy, Recipes, shrimp, Shrimp Dish, Shrimp Recipes, Wrapped Shrimp. You can follow any responses to this entry through the RSS 2.0 feed. You can leave a response, or trackback from your own site.